Did you know that “In God We Trust” didn’t appear on U.S. paper money until 1957? That was the year after President Eisenhower signed into law a bill requiring all American currency to feature the new phrase. The year prior, “In God We Trust” became our country’s official motto, effectively replacing the unofficial slogan of E pluribus unum, or “Out of many, one,” adopted in 1782 with the creation of the Great Seal of the United States. There are many things we take for granted about the U.S. system, making civics education even more important. Our country is dynamic and changeable—our founders built it that way. The U.S. Constitution, Bill of Rights, and laws should not be seen as static documents. They were built to adapt as our country grew, the guiding principles more important than literal interpretation over the decades and centuries. On October 7, 1801 the Danbury Baptist Association of Danbury, Connecticut mailed a letter to President Thomas Jefferson. The Baptists were worried that the Chief Magistrate of their town would impose laws pertaining to his particular religious sect. Jefferson responded with a doctrine known as the “Wall of Separation.” In his response he stated, “I contemplate with sovereign reverence that act of the whole American people which declared that their legislature would ‘make no laws respecting an establishment of religion, or prohibiting the free exercise thereof,’ thus building a wall of separation between Church and State.” So, putting “In God We Trust” on our money or forcing the phrase into our schools could be considered an infringement on someone’s First Amendment right. It doesn’t take an expert to recognize the political implications here. Republicans traditionally see big government as bad, and (by and large) see Christian values as something to aspire to. In making this statement, President Trump insinuates that people who believe in a robust governmental system (Democrats) don’t believe in “faith” or “family” in the same way Republicans do. But why are “big government” and “faith and family” being presented as opposite things? This a false dilemma, forcing a choice or outcome on one of two sides and failing to recognize a third outcome. An individual can have a strong belief in faith and family while still supporting government programs that benefit the community at large. And why did “In God We Trust” become the United States’ motto in the first place, when separation of church and state is one of the founding pillars of our country? It’s true that the phrase “In God We Trust” has been with the U.S. in some sense since its founding. It appeared on the two-cent piece in the mid-1800s and appeared in the original version of “The Star-Spangled Banner.” Finally, in 1956, it was made the official national motto of the United States, mostly as a Cold War response to the enforced atheism of the Soviet Union. But does that mean it should have been written into law as the country’s official motto? The topic has created more than a little controversy. Just this month, an Arkansas law passed requiring all schools to put up “In God We Trust” posters on their campuses. Many people protested, echoing a long history of opinions seeing the phrase as in conflict with the First Amendment of Bill of Rights, which enshrines freedom of, and from, religion. Were Arkansas lawmakers inspired by President Trump’s rhetoric? Is this another example of “In God We Trust” being exploited as a political tool? 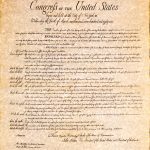 Just as many Christians would likely oppose being forced to put up posters that read “In Allah We Trust” in public schools, so too should they oppose a requirement to put up posters reading “In God We Trust.” Doing so violates our right as Americans to adhere to or not adhere to any religion we choose. 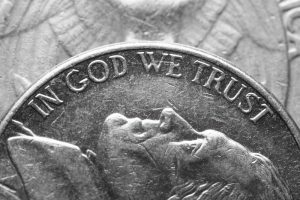 Though adopting “In God We Trust” as a motto may not seem to actively break down the wall between church and state, such choices are dangerous because they erode a founding principle—that the two should be kept separate. We are duty-bound to not only honor the freedom to practice any religion, but also the freedom from any religion. Passing official laws that force adherence to or indoctrination of one religion is a violation of that right. In a country that is so starkly divided, it’s important to hold onto the values that make our country great. Separation of church and state allows people to practice any religion—or be free from any religion—they choose. This right should not be undermined for the sake of political expediency.